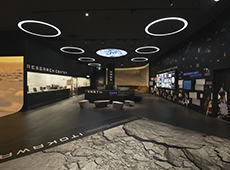 JAXA | Eriko Masaki General Manager, Space Museum TeNQ　"Sharing the Beauty of the Universe"
The Space Museum TeNQ (pron: ten-cue) celebrated its first anniversary in July 2015. Throughout the museum there are many creative exhibits that help visitors feel closer to the universe. The museum’s general manager, Eriko Masaki, reveals the secrets of the museum’s success. — What is the concept of Space Museum TeNQ? 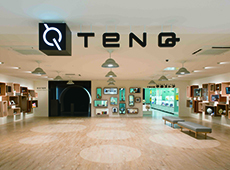 TeNQ is an entertainment museum designed to be enjoyed whether the visitor is already interested in the universe or not. When the topic is space, some people automatically assume that it is difficult and put up their guard. So at TeNQ, we would like visitors to loosen up, and allow themselves to simply enjoy and be enchanted by the universe. We want to make TeNQ an exciting museum where people can feel close to the universe. — So the museum focuses on using entertainment to engage people. Entertainment is a key element, since TeNQ is located in an entertainment facility consisting of the Tokyo Dome (an all-weather multipurpose stadium), a hotel, an amusement park, and a spa complex. We have chosen “the universe” as the concept for the museum because we saw good potential for involving everyone, from children to the elderly. But the universe can cover such a wide range of topics, and you can approach it from so many different angles. Frankly speaking, I didn’t have a particular interest in space before, so in the early stages of planning I wasn’t quite sure what we should do at TeNQ. Then I had a chance to see the magnificent starry night sky at Mauna Kea on the island of Hawaii, where the Subaru Telescope is located. I was so moved. This was when I realized that the concept of TeNQ should be about excitement: about being awed by the beauty of the universe, about the thrill of discovery, about the joy of learning something new and sharing it with others. Our hope is that such an exciting experience will encourage visitors to develop an interest in the universe. — What’s your strategy for achieving this? When designing the visitor experience, we thought about our guests’ “mind stories” – how their mind would work – and designed the exhibition space accordingly. 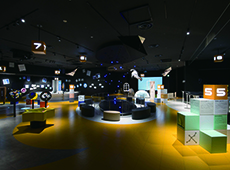 We created nine areas: Entrance, Tunnel ZERO, Starting Room, Theater SORA, Science, Imagination, Exhibition, Connection Place, and Space Store. The flow of the story we designed goes like this: First, you reset your mind as you walk from the entrance through a dark tunnel. 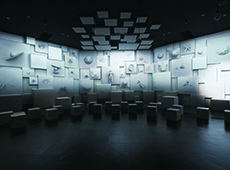 Then, in the Starting Room, which is full of white cubes, there is a surprise waiting for you: with the help of projection mapping, we use the entire room to introduce how humans have viewed the universe from ancient times to the present day. We don’t go into detail, but instead use a montage of historic images to stimulate your imagination. The next area is the Theater SORA. The theater has a unique shape: 11 meters in diameter, with a hole at the center. You look down through the hole to watch video. There, you see real images of the Earth and other planets, galaxies, the starry night sky shot at Mauna Loa in Hawaii, and the Earth seen from the International Space Station, for example – in greater than 4K ultra high definition video. The highlight is that, by looking down into outer space, you can simulate the sensation of floating in space. I’ve heard it said that seeing the Earth from space changes astronauts’ view of the world. This is called the overview effect. Right now only a very small number of people can go to space, but at TeNQ you can feel as if you’re there. We guarantee you a memorable experience. After the video images stimulate your emotions, the next step is to inspire you with science. Because you are already excited, you are more open to things that you may normally think are too difficult for you, and you can make connections with the video you just saw in the other areas. So we have designed the exhibits by imagining how visitors’ minds would work. The video show emphasizes entertainment, but in the Science area, by contrast, we introduce a lot of real, cutting-edge research. Then in the area called Imagination, you can enjoy the universe in whatever way you want, having fun with the various exhibits. There are interactive exhibits, including a quiz, a puzzle that allows you to create your own planet, and a game where you fly a rocket by operating a robot. There is also a corner for viewing art and watching videos about the universe. So each area is given a different role, but they are also sort of mixed intentionally. We have combined various elements here and there, and it is up to visitors where and how they become excited or moved. We would like them to feel something at TeNQ, and to go home with memorable experiences. So we design the exhibits thinking about how our visitors’ minds will work. — You’re also trying to provide a comfortable environment for visitors. We allow visitors to enter the museum every 15 minutes, with a maximum of 70 people at any one time, so it is very rare that it becomes crowded. In the Theater SORA, for example, everyone can watch the video from the front row. After the theater experience, they are invited to move to the next area, so we can usually avoid situations where there are too many people crowded in one exhibit. We work hard to make sure that visitors are exposed to the universe in a comfortable environment. — I was surprised to hear that there is a real laboratory in the Science area. 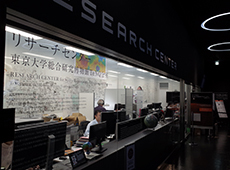 Yes, our exhibit includes a Research Center, which is a satellite office of the University Museum of the University of Tokyo, under the supervision of associate professor Hideaki Miyamoto. Prof. Miyamoto specializes in planetary science and solar system exploration. He is a leading scientist in the study of Mars and its exploration, and is also involved in the HAYABUSA 2 project. At the Research Center, scientists are actually working on research, and visitors can watch them work. The latest results are presented directly to the public, and this is one of our big highlights. For example, images sent from NASA’s Mars explorer are shown on the monitor, and the information is constantly updated. Conventional science museums restrict their exhibits to things that have already been proven. But at TeNQ, we show what is under debate at this very moment. Visitors can see information that regular people normally don’t have access to, and the information is updated daily, so visitors can get the latest every time they come to the museum. 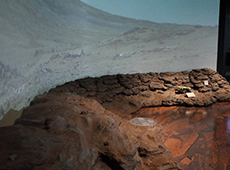 In addition, there is a corner where visitors can touch a piece of a Martian meteorite, and the Mars Research Project allows them to take part in actual research. I think that these events are unique experiences. After all, authenticity touches people. We hope that, having seen real research data and real-life scientists working, some people will be inspired to pursue an interest in space development or in the universe. — Frequently updating the information must contribute to the number of repeat visitors. That’s correct. We want people to come back to TeNQ many times, so we plan different exhibitions and seasonal events, for example for Christmas and Halloween. We have also hosted lectures by world-class scientists, and a public viewing of a rocket launch with the help of JAXA. We try to offer excitement that you can only get at our museum, rather than just providing knowledge that you only need to hear once. — Could you tell us about your past exhibitions. We change the content every three or four months. 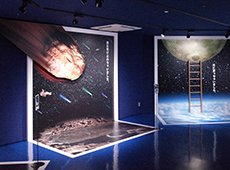 The first exhibition was about TeNQ-style space travel, the second was about Ultraman (a popular Japanese science fiction TV series), followed by exhibitions featuring illustrations of the universe, and the manga Space Brothers. 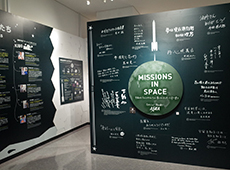 The current exhibition is about people with space-related careers – people working at JAXA and elsewhere in the space field. I had the opportunity to meet some of them in the course of curating our past exhibitions, and really enjoyed the experience. I thought the public would enjoy learning about space-related work through the people who work in the field – empathizing with their words, the way they work, and the stories behind what they do. Let’s say there is a woman who is not interested in the universe or technology at all. Even someone like her will be touched if she hears the story of someone getting in trouble in space and surviving, wouldn’t you say? So we introduce people whose jobs are space-related – astronauts, scientists and engineers – along with their anecdotes and messages to the public. 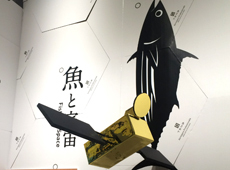 We also introduce space technologies used in daily life, for example in fishing or growing rice. — To show how space technology is used in fishing, you provide a lot of detail about people – for example interviews with people working in the industry – but at the same time, you show satellites as simply yellow boxes. I found the contrast very interesting. Typical exhibition facilities may use sophisticated satellite models, but our objective is to show the relationship between satellites and people – how satellites are being used in real life – so it’s enough to just show the satellites as icons. If visitors would like further information, we think that they can look into it themselves or visit other facilities. In fact, when we consulted JAXA about the idea for this exhibition, they told us they’d held a similar exhibition before. Changing the style of the exhibits and the décor of the museum space can really affect the visitor’s experience. For instance, displaying a product beautifully in a stylish shop can make it look much nicer. So in our case, we try to show things differently from other facilities in order to offer visitors a sense of intimacy. Take for example the entrance of TeNQ: the décor uses a lot of wood, so it feels like a café. We wanted to go with softness and unpredictability to distinguish us from typical science museums, space theme parks and science fiction. 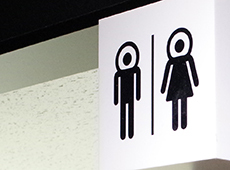 — Even the toilet signs are different, right? — Do you often collaborate with research institutions? 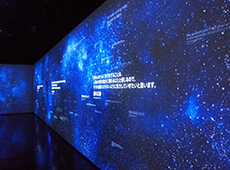 We are not space experts, so for the current exhibition, about people with space-related careers, we worked with JAXA employees and other experts, and for the exhibition on illustrations of the universe we collaborated with the Four-Dimensional Digital Universe Project at the National Astronomical Observatory of Japan. Our collaborators introduce us to the people we need to meet for our workshops, and this way our space network is gradually expanding. Our biggest strength is being able to show the universe as entertainment. Prof. Miyamoto at the University of Tokyo decided to collaborate with us because he saw a new opportunity for public outreach. We are hoping we can continue to plan and implement exhibitions in collaboration with those who specialize in space research and technology, as well as others from the space industry. — It has been a year and a half since the museum opened. How have visitors’ reactions been so far? Which area is the most popular? We would like families to visit TeNQ, of course, but our main target is women in their 20s and 30s. We want to have a museum where women feel comfortable to come alone. And indeed, we’ve met our target: 60 percent of our visitors are women, many in their 20s and 30s. Theater SORA is very popular, but some say that their favorite is the Starting Room, because it gives them a real sense of being “there,” while others spend hours with the Mission Rally Q, where they have to find answers in the exhibits as they go. So everyone is different. But we didn’t expect that so many visitors would be taking photos in the Word-arium, a room that introduces words inspired by the universe. Surprisingly many take selfies beside the words displayed in this dark and mysterious room. Knowing that people like taking photos to share on social media, we made a special effort to create good photo backdrops, but this phenomenon was truly unexpected. While we are happy to see things working as we originally planned, we are often surprised to find that people are intrigued by things we never expected to be so popular. — So people can take pictures freely? They can take photos anywhere, except in the Starting Room, Theater SORA and the Research Center. We are happy to see photos spread through social media because that way more people hear about TeNQ. But at the Research Center, visitors are asked not to take photos, to avoid interfering with the scientists at work. — Have you been in the entertainment business for a long time? I was involved in the opening of the spa complex LaQua, which opened in 2003 at Tokyo Dome City, and also worked on the shopping mall and the redevelopment of the old amusement park area. Tokyo Dome City was originally a place that appealed mainly to men, with baseball, martial arts and horse racing. The objective of the redevelopment was to bring women and families to the site. The experience I have gained with the other projects was very useful for planning a space museum that targets women. — Have you developed a fondness for the universe? I think so. I can look at the universe only from an average person’s point of view, but I definitely feel more familiar with it and more interested, as I meet more people who work around space. Everyone is so passionate about their job, that I am totally drawn to their stories, regardless of their specialty. It is much more interesting than learning from books. After I heard about the moon, I look up at it at night and appreciate its beauty. Also, meeting with JAXA employees and researchers gives me more awareness of space-related news. I think my perspective has broadened thanks to this job. — Are there new things you would like to try in the future? Many people expect to get something extraordinary in entertainment every time. Of course there is a type of entertainment for times when you don’t want to think about your daily concerns and just refresh yourself. But I think that there can also be a kind of entertainment that can make the everyday more enjoyable. Going to a museum or a spa after work – I would like to suggest that people add such forms of entertainment to their daily lives. TeNQ is open until 9 pm, so I think visitors have enough time to enjoy the museum after work. I would like TeNQ to be an entertainment museum where people can stop by casually when they feel tired from work and want to relax watching video of the beautiful universe. Our museum is not well-known enough to achieve this goal yet, so we need to make a greater effort in promoting it by planning interesting exhibitions, for instance. We want to strive to continue to offer excitement at TeNQ. — What kind of expectations do you have for JAXA? 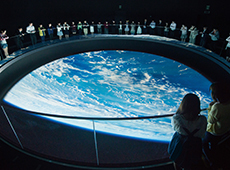 I think it’s possible for even a commercial complex such as ours to introduce the public to the beauty and excitement of the universe, in a different way than JAXA. The universe has always been something that catches people’s attention – its attraction is universal. By collaborating with JAXA, we are sure that we can offer excitement and memorable experiences. For the asteroid explorer HAYABUSA 2, for example, we would like to take advantage of our permanent facility, and not just feature the launch but also follow up on its mission later on. TeNQ opened only a year and a half ago, and there is still a long way to go. We will be delighted if JAXA can continue to work with us in the future. 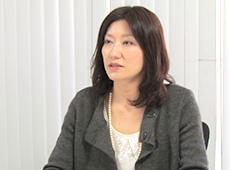 TeNQ General Manager, Space Museum Department, Tokyo Dome Corp.
After joining Tokyo Dome Corporation, Ms. Masaki was assigned to the Tokyo Dome City redevelopment project team, and worked on the spa complex LaQua. Subsequently, she was involved in the development of the food court, GO-FUN, which opened in 2011. The same year, she joined the Space Museum TeNQ project, in its planning stage. TeNQ opened in July 2014, and she was appointed to her current position in August 2015.